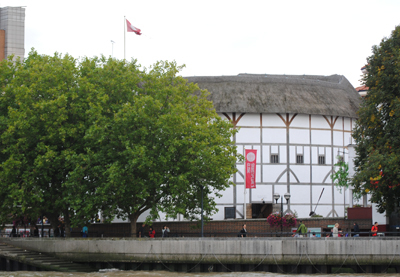 Mention William Shakespeare and London in the same breath and everyone immediately thinks of one building – the reconstructed Globe on Bankside. So we thought that to kick off our new series – being run in honour of the 450th anniversary of the playwright’s birth – we’d take a look at history of the iconic structure. The original Globe Theatre, located a few hundred metres to the south, opened in 1599 as a home for the actors’ company known as the Lord Chamberlain’s Men (later renamed the King’s Men on the accession of King James I in 1603), of which Shakespeare was a member. Founded by James Burbage, this merry band was originally was housed at London’s first purpose-built playhouse Shoreditch before lease disputes led them to establish a new theatre in Southwark, close to the then existing theatre, The Rose. Up and running by 1599 (Shakespeare was among four actors who bought a share in the property to help fund the new building which used timbers from the former Shoreditch theatre), the new theatre was used for 14 years until, during a performance of Henry VIII in 1613, wadding from a stage cannon ignited and the theatre burned to the ground. Rebuilt with a tiled roof, it remained the home of the company until it was closed down by the Puritan government in 1642 and demolished two years later. 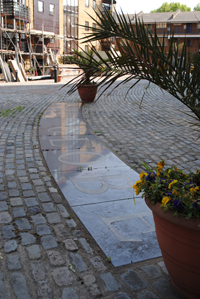 You can see the original site of The Globe just in nearby Park Street. The shape of the structure is marked by a dark line embedded in the pavement (pictured). The reconstructed building which stands proudly by the water today was the vision of the late American actor, director and producer, Sam Wanamaker. He founded the Shakespeare Globe Trust which, with the on-site assistance of Queen Elizabeth II, opened the theatre at its current site in 1997 (sadly, Wanamaker had died three-and-a-half-years previously). The building’s design was drawn from sifting through what little historical evidence could be found including the findings of an archaeological dig at the original site, descriptions contained in Shakespeare’s plays (including the line from Henry V – “Or may we cram within this wooden ‘O’), and printed panoramas from the time, although it should be noted that much – particularly the design of the stage – is speculative. Meanwhile the techniques used in the construction of the theatre were the subject of years of research and were in accord with those of the early 17th century and included using oak laths and staves to support lime plaster and then covering the walls in white lime wash while the roof was made of water reed thatch. One of the best ways to see the theatre and make the most of the atmosphere is to see a play from a standing position in the pit! WHERE: Globe Theatre Exhibition & Tour, Shakespeare’s Globe, 21 New Globe Walk (nearest Tube stations are Southwark and London Bridge); WHEN: Exhibition is open 9am to 5.30pm daily – tours run at various times, see website for details; COST: Exhibition and tour cost is £13.50 adults/£12 seniors/£11 students/£8 children (5-15 with children under five free)/£36 family of four; WEBSITE: www.shakespearesglobe.com. OK, something this big can’t exactly be a secret but due to the fact it lies well out of the city centre, the vast expanse of Richmond Park in the city’s outer south-west, not far from the Thames, can get overlooked. At almost 1,000 hectares, Richmond Park is the largest open space in the city and is home to some 650 Red and Fallow deer who roam about at will. While the park’s royal connections go back to Edward I (1272-1307) when the area was known as the Manor of Sheen, a name which was changed to Richmond during the reign of Henry VII (1485-1509), it wasn’t until 1637 that Charles I decided to enclose the land with walls that remain to this day. Deer aside, the park is also home to Pembroke Lodge which in 1847 became the home of then Prime Minister Lord John Russell (and is now a restaurant). The park’s features include King Henry’s Mound – which boasts great views on a clear day including that of St Paul’s Cathedral (12 miles away) – and the Isabella Plantation – an ornamental woodland garden. 1. 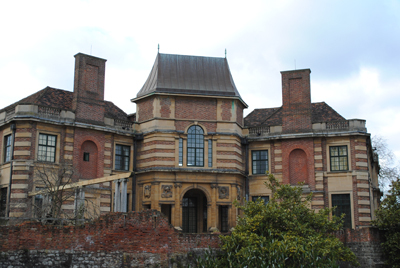 Eltham Palace. 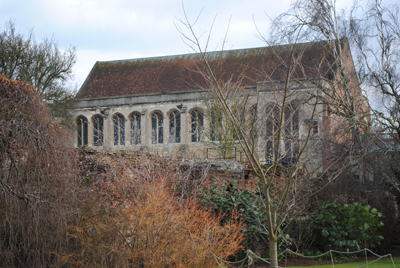 While Henry VIII’s final home, Hampton Court Palace, remains among London’s top 10 tourist sites, less well known is his childhood home, Eltham Palace. True, nowhere near as much of it remains from the Tudor and earlier medieval times, but with a later adjoined 1930s mansion housing some amazing Art Deco interiors, the medieval remains are just the start. The palace’s history can be traced back to the Domesday survey of 1086. It passed into royal ownership in 1305 when then owner, Anthony Bek, Bishop of Durham, gave it to King Edward I. Numerous kings and their families spent time at Eltham including Edward III, Henry IV, and Henry VI, and it was Edward IV who, between 1475 and 1480, ordered the Great Hall built – a treasure which still survives. Henry VIII was the last English monarch to spend considerable time at Eltham – it was elipsed by Greenwich Palace as a royal residence – and, after falling into disrepair into the seventeenth century, it passed back into ‘non-royal’ hands. Much of what stands at Eltham today dates from the 20th century when millionaire socialites Sir Stephen and Lady Virginia Courtauld oversaw the restoration of the medieval Great Hall and the construction of an adjoining mansion which is a masterpiece of 1930s style incorporating a combination of Art Deco, “ocean-liner style” and Swedish design. The Courtaulds left for a new life in Southern Rhodesia in 1944 and from then until the early 1990s the military occupied the property. English Heritage subsequently oversaw a major restoration and opened it to the public in 1999. It’s well worth a visit to see the medieval Great Hall (which apparently boasts the third largest hammer-beam roof in England) and the 1930s property (aside from the stunning interiors – including Virginia’s gold-plated bathroom and warmed sleeping quarters for the Courtauld’s pet lemur – there’s also some great Courtauld family movies on show which give an amazing insight into the family which once lived there and an audio guide tour fittingly narrated by David ‘Poirot’ Suchet). There’s also 19 acres of gardens to explore, including a magnificent medieval bridge spanning what remains of the moat, and a cafe to while away the afternoon.